We may tell ourselves that we know what we’re doing. That we are the masters of our domain. That we’ve got this and everything would be great if others would just get the heck out of our way. Other times we fight the imposter syndrome, striving to maintain a brave face and hoping against hope that no one figures out how deeply we are struggling. Or we may not even start something in the first place simply out of fear. We’ll feel foolish. We’ll never be good at it. Others may laugh. Of course, the reality is that much of the time none of us completely knows what we are doing. But here’s the thing . . .
We don’t have to be an expert to add value. 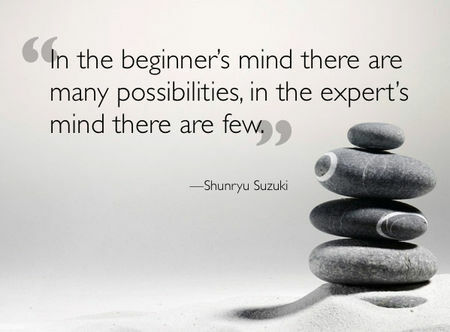 Often it is the mind of the beginner that uncovers an innovation that matters. We don’t have to be great to be useful. If I’m just a bit better at something you need than you are, I can be of service. We don’t have to be perfect. Good enough is often just that. Steve. I really enjoyed your post. So positive and realistic. Thanks for an upbeat message. Once again you have dispensed wisdom that fits the moment here at our store. . Thank you for your thoughtful posts. Irene Mylan, Clothes Circuit. I’m looking for a job outside of my profession of the last 30 years and have been feeling a bit in over my head. Thanks for the inspiration! Next Next post: Everywhere. And nowhere.